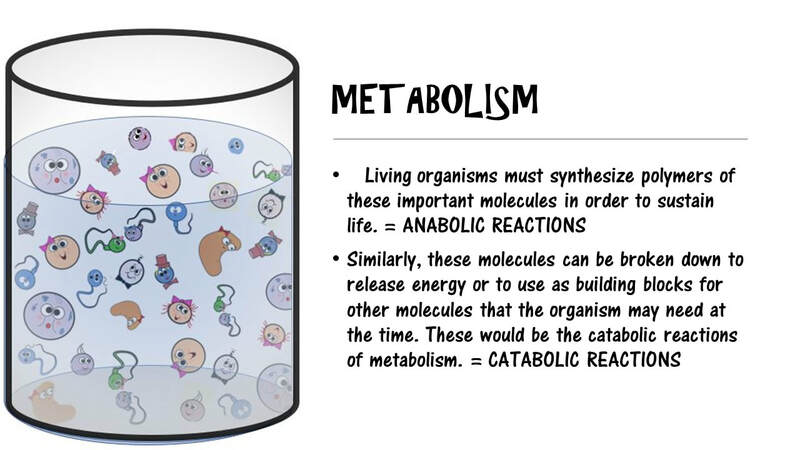 Metabolism is the sum of all of the chemical reactions that occur in the living organism. These chemical reactions are necessary to sustain life! Since metabolism involves chemical reactions, you may want to review some of the basic concepts of chemistry before we start. Atoms can either gain or lose one or more electrons from their outermost shell and become charged. A charged atom is called an ION. An atom that gains 1 electron will become an ion with a -1 charge. An atom that gains 2 electrons will will become an ion having a charge of -2. An atom that gains 3 electrons will become an ion with a -3 charge... and so on. When an atom loses 1 electron, it will become an ion with +1 charge. When an atom loses 2 electrons, it will become an ion with +2 charge. When an atom loses 3 electrons, it will become an ion with +3 charge... and so on. 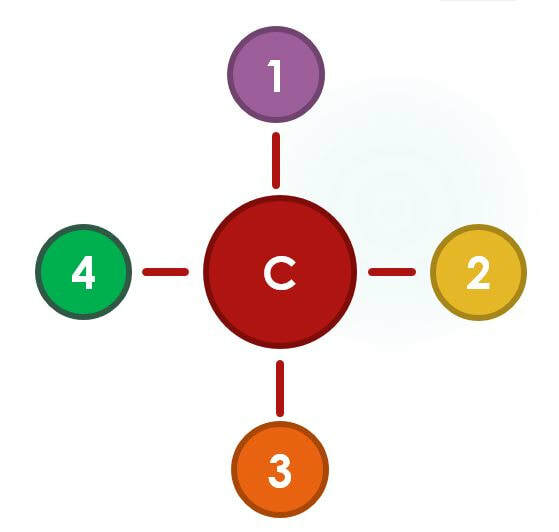 The carbon atom is able to form up to 4 strong covalent bond with up to 4 other atoms or molecules. ​This allows for a huge variety of possibilities and possible structures. This is why we observe large organic molecules with complex and elaborate shapes. 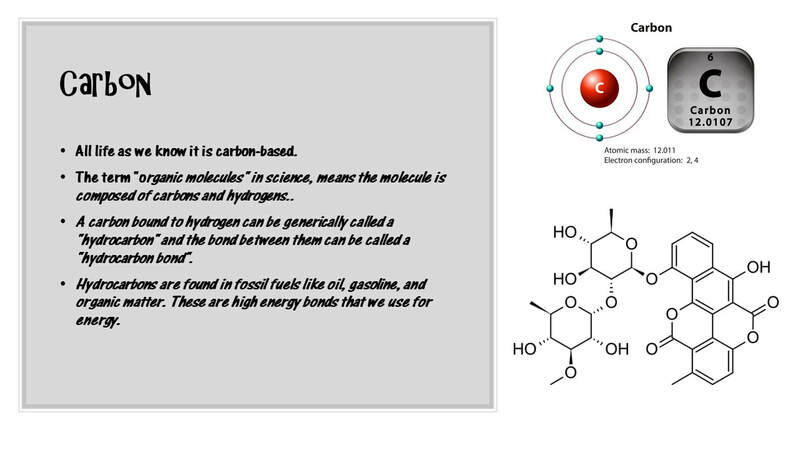 The term "organic molecules" in science, means the molecule is composed of carbons and hydrogens..
a carbon bound to hydrogen can be generically called a "hydrocarbon" and the bond between them can be called a "hydrocarbon bond". Hydrocarbons are found in fossil fuels like oil, gasoline, and organic matter. These are high energy bonds that we use for energy. Your cells are 75% water. All life needs water. Water is resistant to temperature change. Temperature is really a measure of the kinetic energy of the molecules of a substance. Energy is the energy associated with the random movement of atoms and molecules. Temperature measures the intensity of heat—that is, the average speed of molecules in a body of matter. Water is considered a POLAR molecule. Since it is slightly negative on one end, and slightly positive on the other end! The Polarity of water allows it to have the ability to dissolving a variety of different substances! This is why water is called the UNIVERSAL SOLVENT. Water can dissolve more substances than any other molecule! Also, atoms have to get close enough to react in order to form molecules.... And, since ATOMS DON'T have legs... The atoms are able to find each other as they float around in water. In water, atoms can easily travel and react! Triglycerides consist of three fatty acids bonded to a glycerol molecule. Fatty acids are hydrocarbons (chains of covalently bonded carbons and hydrogens) with a carboxyl group (–COOH) at one end of the chain. A saturated fatty acid the maximum possible number of hydrogens bonded to it. The carbon back bone contains only single bonds. Unsaturated fatty acids have less hydrogen bonded to it due to having one or more double bonds. This double bond is a the CIS configuration. “Transfats” are unsaturated fats that have one or more double bonds in a TRANS configuration. [CIS (same) vs TRANS (opposite)] CIS fats are healthy fats that promote good cholesterol. TRANS fats, on the other hand, can be harmful and can contribute to a decrease in cardiovascular health. Examples of TRANS fats include substances that are made from unnatural sources like hydrogenated oils. Metabolism is a requirement for life. It is the means by which all life forms, including microorganisms, obtain and use energy. This energy is required for growth, repair, and maintenance of the chemical and physiological processes of the cell. Energy is also needed to maintain the structural integrity of the cell by repairing or replacing damaged components. Hydrocarbons are composed of carbon and hydrogen. In nature, hydrocarbons take the form of crude oil and natural gas. That being said, hydrocarbons are the primary energy source for most of the world today. ​ Hydrocarbons can be found in living organisms in the form of hydrocarbon chains within certain molecular structures. A good example of this are the hydrocarbon chains found in lipids (fats) that provide fuel to your body. Hydrocarbons are very good at forming covalent bonds with other hydrocarbons to form long chains or rings. Metabolism: Metabolism is a general term for all of the biochemical reactions taking place within an organism. 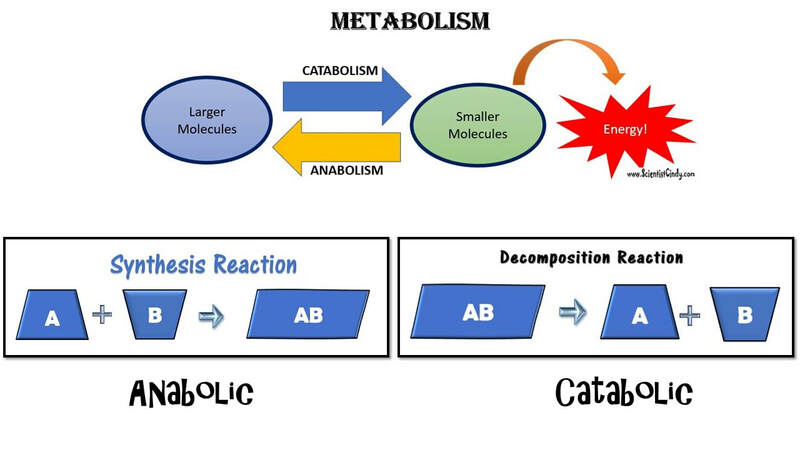 The biochemical reactions of metabolism fall into 2 broad categories; 1) anabolism, and 2) catabolism. Anabolism is the set of metabolic reactions that create or synthesize larger, more complex molecules from smaller ones. Anabolic reactions are synthesis reactions. Anabolism involves the process of creating or building chemical bonds, which requires energy in the form of ATP. Reactions that require energy are called endergonic. Catabolism: Larger molecules are broken apart into smaller molecules by breaking chemical bonds. Reactions that release energy are called exergonic. For example, in glycolysis, a glucose molecule is split and energy is released. Anabolic reactions require energy to build, so they are considered endergonic reactions. These endergonic, anabolic reaction create chemical bonds that store potential energy, like a new battery that has not yet been used. When that potential energy is needed, the bond will be broken to release that potential energy so that it can be used. What Types of Substances are Metabolized? Most microorganisms obtain their energy from the nutrients they take into the cell. For microorganisms, these nutrients may come from either an organic or an inorganic source. Once the energy-giving nutrients enter the cell, they must be chemically processed so that they can be used. They are of no use to the cell in their "raw" form. The chemical processing that takes place involves a series of chemical reactions (called a metabolic pathway) that will function to trap some of their chemical energy and to break down the larger molecules into smaller molecules that can be used as building blocks for the synthesis of new cellular components. 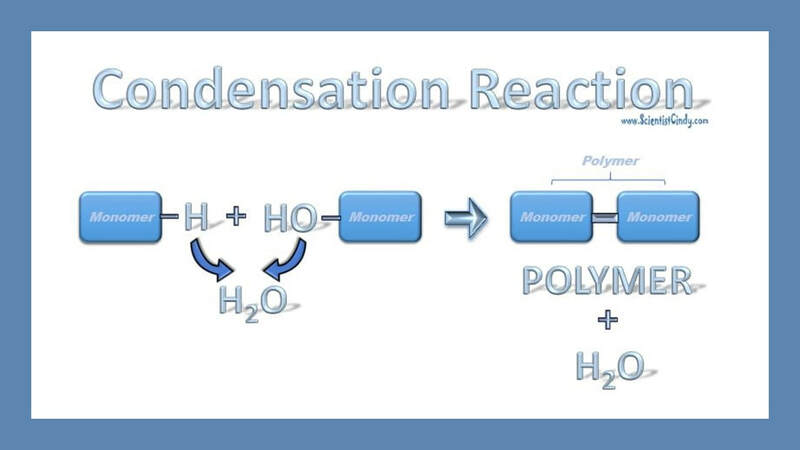 This a condensation reaction in which water is removed from 2 amino acids that become joined. The products of this reaction is a dipeptide and a water molecule. Anabolic reactions usually proceed as a condensation or synthesis reaction. ​In a condensation reaction, hydrogen (H+) is removed from one of the monomers and a hydroxyl group (OH-) is removed from the other monomer. The hydrogen (H+) and the hydroxyl group (OH-) combine to form water (H2O) as a byproduct of the reaction. As this occurs, a covalent peptide bond is formed. 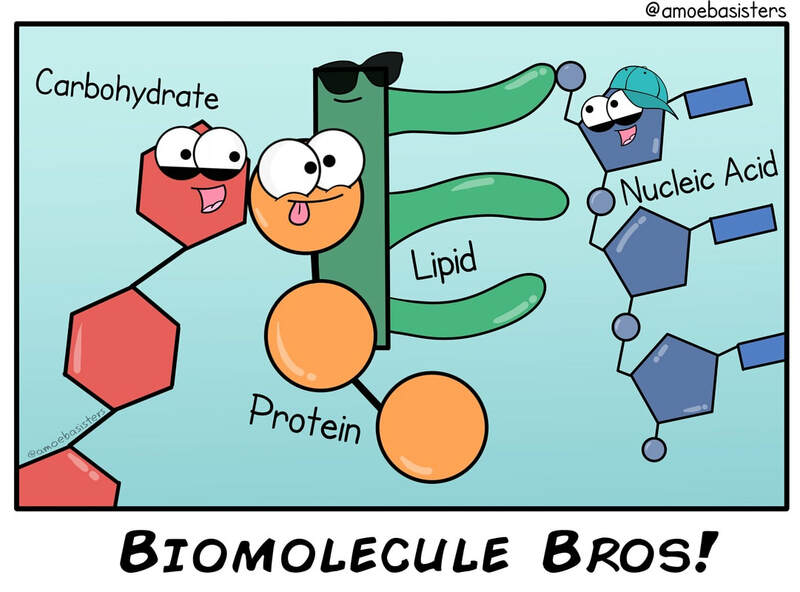 What bonds are formed in the creation of the 4 major classes of biomolecules? Energy Source - Cells processes require energy - Cells can use ATP to fuel its processes. An enzyme is usually a protein. 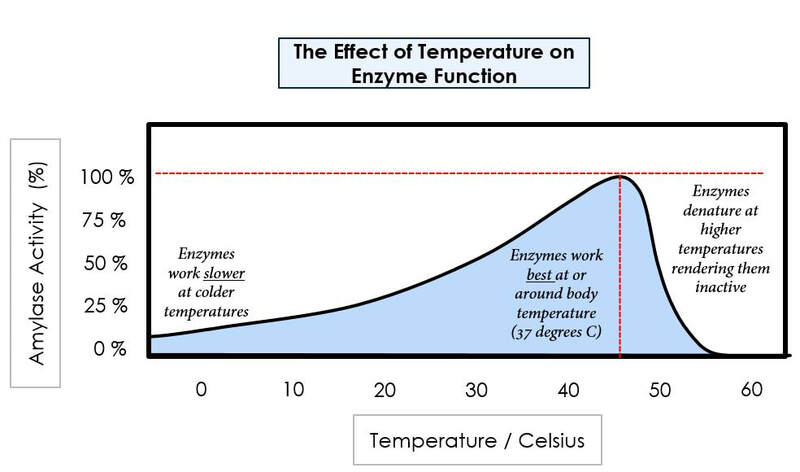 Enzymes are catalysts which function to reduce the activation energy of a chemical reaction, so that the reaction occurs much more quickly than it would in the absence of the enzyme. The speed difference is usually several orders of magnitude faster with the addition of the enzyme. For example, a single lunch would take thousands of years for our bodies to metabolize in the absence of enzymes. ​ An enzyme is specific to the reaction it catalyzes. There are different mechanisms by which catalysis can occur. A common mechanism is the "lock and key" synthesis model. In the lock and key synthesis model, the enzyme interacts with the substrate specifically in a lock and key fashion. The shape of the substrates fit perfectly and specifically into the active site of the enzyme like a key in a lock. In biology, when we see this pattern of shapes fitting together perfectly with each other, we say that the shapes are complimentary. Breaks C-C, C-O and C-N bonds. catalyzes geometric or structural changes within a molecule. Chemical formula stays the same, but structure may differ. Comes from the Latin word "ligare" which means "to tie together"
Enzymes have an active site. Enzymes will have names that end in "-ase"
The rate at which an enzyme converts its substrate into product is affected by many factors. Temperature - The rate chemical reactions increases with increasing temperature, because the heat is adding kinetic energy to the molecules which makes them move faster. noncompetitive inhibitors: bind to a different site from the one the substrate uses. This binding can result in allosteric inhibition by altering the shape of the substrate binding site. Energy taken up by the cell, be it in the form of nutrients or sunlight, must be converted into a usable form. The usable form is ATP. ​ATP is a high-energy transfer compound, that has the ability to store potential energy in its chemical bonds. The potential energy found in ATP comes from the breakdown of nutrients or by the trapping of sunlight energy (in photosynthesis). For example. the catabolic reactions that break down glucose, generate ATP. ATP is adenine triphosphate. The bond that we are most interest in is the bond that links the third phosphate group. This bond hold a lot of potential energy and is considered a ‘high-energy’ phosphate bond. When energy is needed, this bond can be broken and energy is released. When the bond is broken, ATP is broken down to form ADP and inorganic phosphate (Pi). 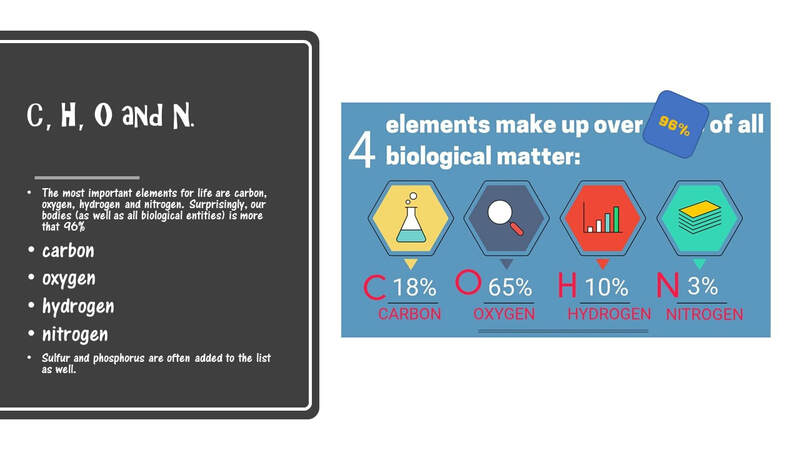 ​- We can categorize organisms based on how they obtain CARBON from the environment. Organisms are categorized as either autotrophic or heterotrophic based upon how they get their carbon. ​Humans get their carbon from consuming organic molecules. Prokaryotes are more diverse in their metabolism. HETEROTROPHS - organisms that cannot synthesize their own food. These organisms must consume organic molecules (sugars, proteins or lipids). ​- We can categorize organisms based on how they obtain ENERGY from the environment. Organisms are categorized based upon how they get their energy. HOW DO CELLS MAKE ATP? ATP is a high energy molecule. In order to make a high energy molecule, you need to use another high energy molecule. You can think of energy as the movement of electrons. In order to generate ATP, it must generate something that moves. Then this can be used to generate ATP. The movement of electrons gives the energy needed to make ATP. Need an electron source and an electron acceptor..
1) Take a molecule that has high energy electrons and breaks it down, which releases the high energy electrons and releases energy. 2) Electrons move to an electron acceptor molecule. Different molecules can be used as electron sources and electron acceptors in the metabolic processes. Electron Sources: Humans must consume proteins, sugars and lipids. Chemoorganotroph - organisms that use organic chemical compounds (proteins, sugars and lipids) as the electron source. Electron Acceptors: Humans are limited to oxygen as their electron acceptor and Pyruvate as their electron acceptor (only occurs in muscle cells when oxygen levels are low). 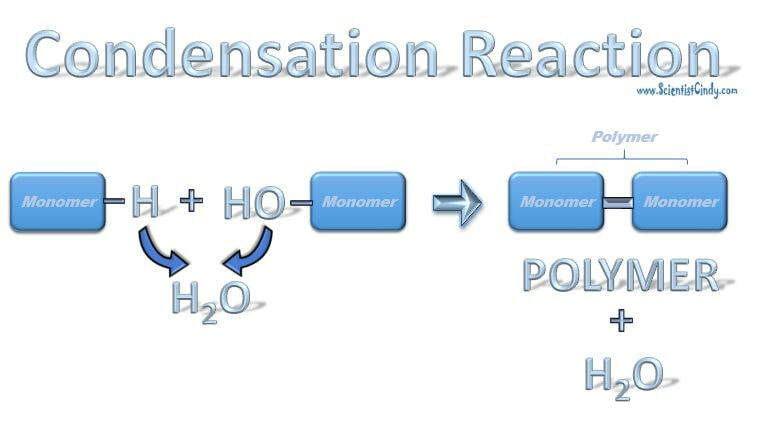 Respiration - the process of using an inorganic molecule as the electron acceptor. 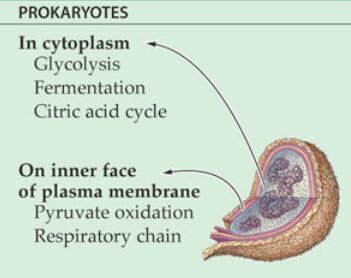 ​Chemoorganotroph - prokaryotic organisms that use organic chemical compounds as the electron source. Chemolithotroph ("litho" means rock) - prokaryotic organisms that use inorganic chemical compounds as the electron source. Toluene - some prokaryotes can use toluene as their electron source. Ammonia - some prokaryotes can use ammonia as their electron source. Arsenic - some prokaryotes can use arsenic as their electron source. Phototroph - Some prokaryotes are able to harness energy of light to energize the electrons from an otherwise low energy source. When the electrons are energized, they are moved (along an electron transport chain) which provides energy for the cell to make ATP. ​Respiration - prokaryotes can use a wide variety of inorganic molecules as electron acceptors in the process of respiration. 2 types of respiration exists, 1) aerobic respiration or 2) anaerobic respiration. Nitrates - Some prokaryotes can use nitrates as their electron acceptor. Sulfates - Some prokaryotes can use sulfates as their electron acceptor. Iron Compounds - Some prokaryotes can use iron compounds as their electron acceptor. Humans are limited to using organic molecules as the electron source and oxygen as the only electron acceptor (almost always, since pyruvate can be used in muscle cells). 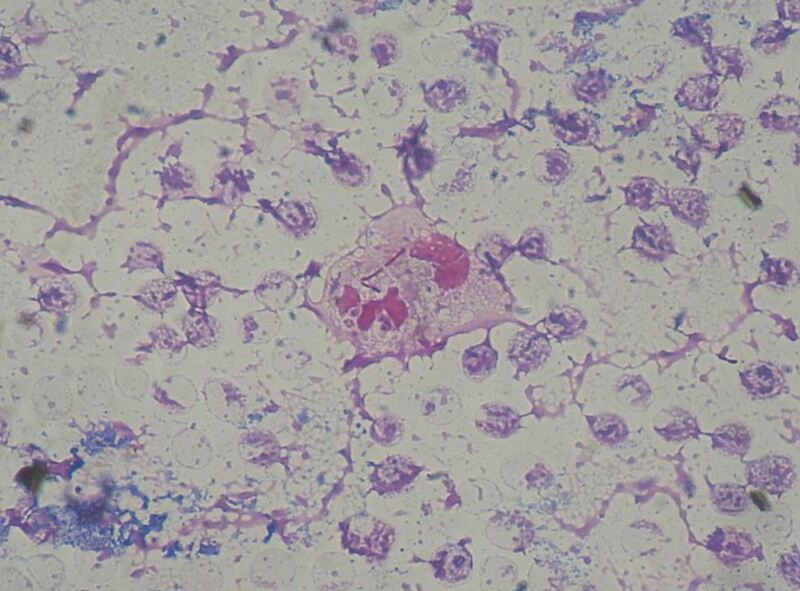 ​In other words these are aerobically respirating chemoorganotrophs. Microbes have the ability to metabolize lipids and proteins. 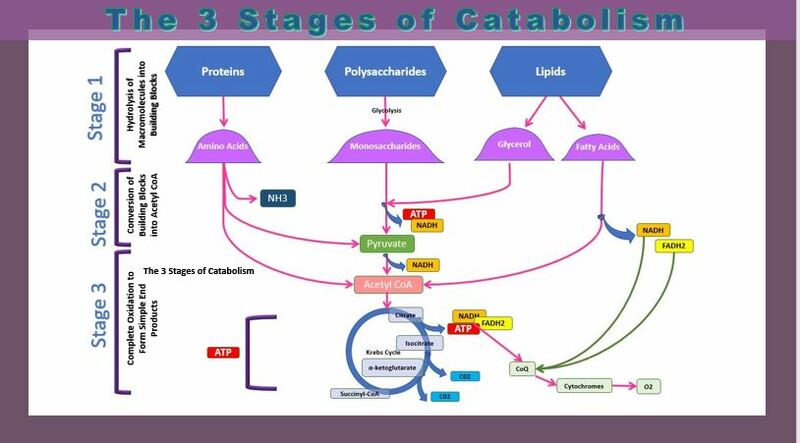 The catabolic pathways for metabolizing lipids and proteins join with the processes of glycolysis and the Krebs cycle. Triglycerides - Enzymes called lipases function to break down glycerol into its smaller fatty acid subunits. 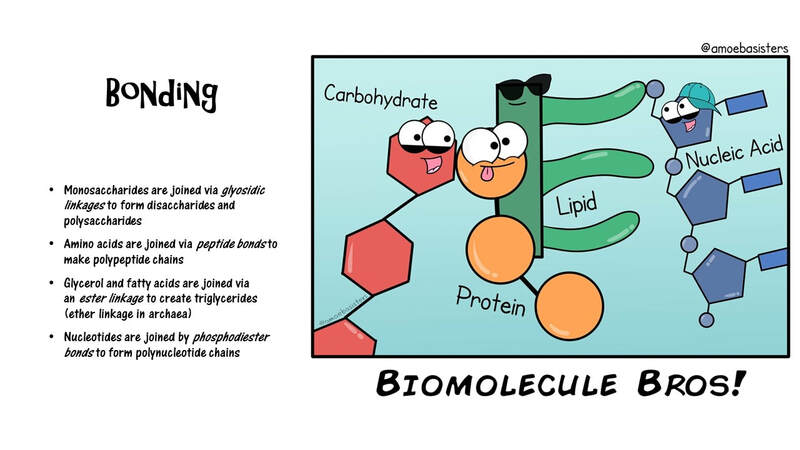 Phospholipids - Enzymes called phospholipases, break apart the phospholipid molecule into its individual fatty acids and phosphorylated head units. Fatty acids - A process called β-oxidation removes acetyl groups from the ends of fatty acid chains. Proteins - Enzymes called proteases break up large proteins into smaller amino acids chains called peptides. 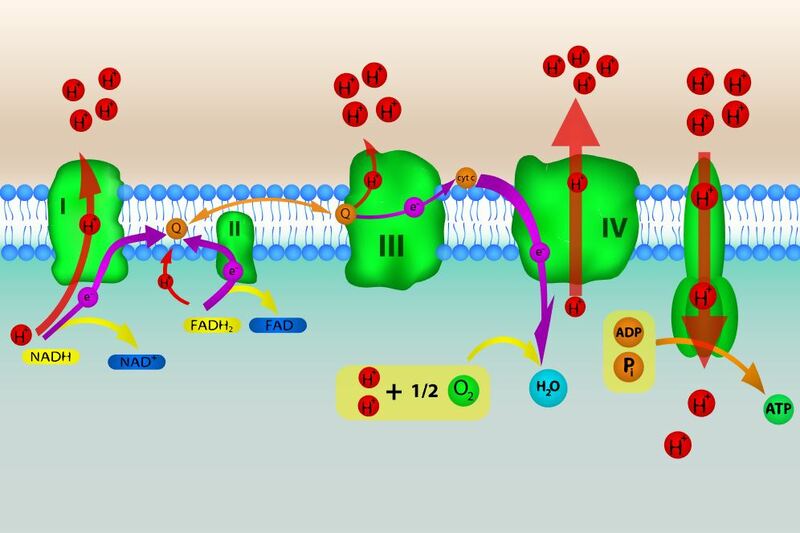 - NADH transports electrons from cellular respiration to the electron transport chain. energy is released as the electrons move along the transport chain. chemiosmosis occurs - the energy given off by electrons is used to pump protons across a membrane via a proton pump. The energy generated from the electrochemical gradient of protons provides the energy for ATP synthesis. ​Glycolysis can occur with or without oxygen, and is common to both aerobic and anaerobic organisms. 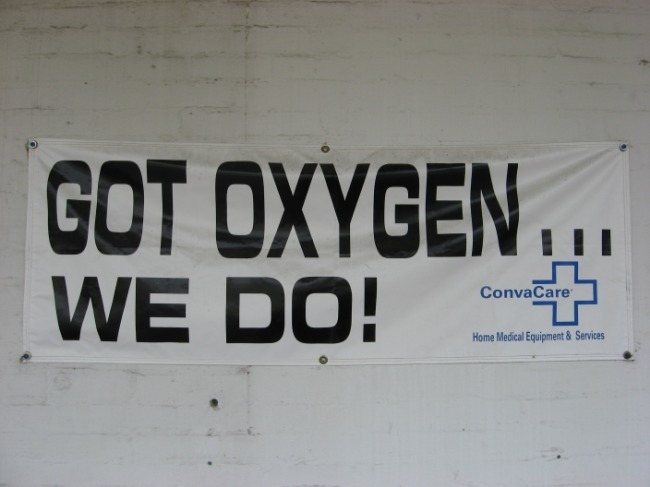 Oxygen is essential, however, for aerobic respiration, by which ATP is generated from the products of glycolysis. Anaerobes proceed down their own pathways following glycolysis, but these lack the ATP-generating power of the aerobic process. 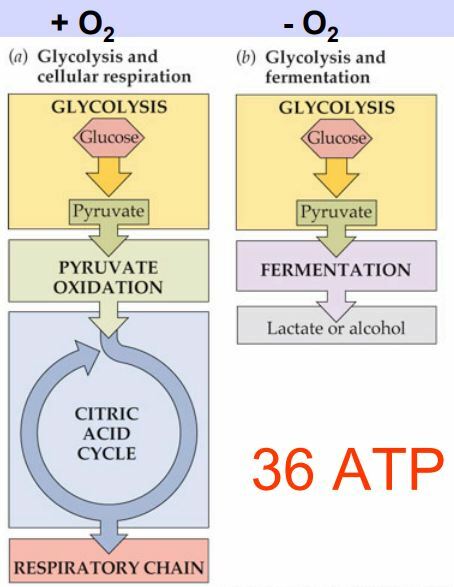 All heterotrophs will undergo some sort of catabolism of lipids, proteins and nucleic acids (as well as carbohydrates) can all feed into the Citric Acid Cycle. Glycolysis is performed in all living organisms. Glycolysis always takes place in the cytoplasm of the cell. Glycolysis does not require oxygen and can be performed in both aerobic and anaerobic prokaryotes. An energy investment phase - In the energy investment phase of glycolysis, 2 ATP molecules are used break glucose into 2 glyceraldehyde 3-phosphate (G3P) molecules. An energy payoff phase - In the energy payoff phase, energy is captured from the 2 G3P molecules, and 4 ATP molecules, 2 NADH molecules, and 2 pyruvate molecules are formed. Glycolysis is the breakdown of glucose, resulting in the formation of ATP, which is produced by substrate-level phosphorylation, along with NADH, and two pyruvate molecules. Glycolysis does not use oxygen and is not oxygen-dependent. There are different types of glycolysis. The first one we will discuss is the glycolytic pathway used by most microorganisms, the Embden-Meyerhof-Parnas (EMP) pathway. The glycolytic pathway in most prokaryotic cells is called the Embden-Meyerhof-Parnas (EMP) pathway. Glucose is the energy source. 2 ATP molecules are hydrolyzed into 2 ADP which releases energy, This provides the energy needed to add 2 phosphate molecules (PO4) to glucose. The glucose is then split in half. 2 more phosphate molecules (PO4) are added. NAD+ is the electron acceptor. It picks up the electrons and delivers them to oxygen in the cell. when the electron is picked up, it also picks up a proton to become NADH The NAD+ will pick up these electrons. The phosphate groups are removed from each half of the molecule, generating ATP. ​Pentose Phosphate Pathway (PPP) Also knowns as.... The Phosphogluconate Pathway or The Hexose Monophosphate Shunt. The ED glycolytic pathway is the only form of glycolysis used by the gram-negative pathogen Pseudomonas aeruginosa is a common bacteria known for antibiotic resistance. 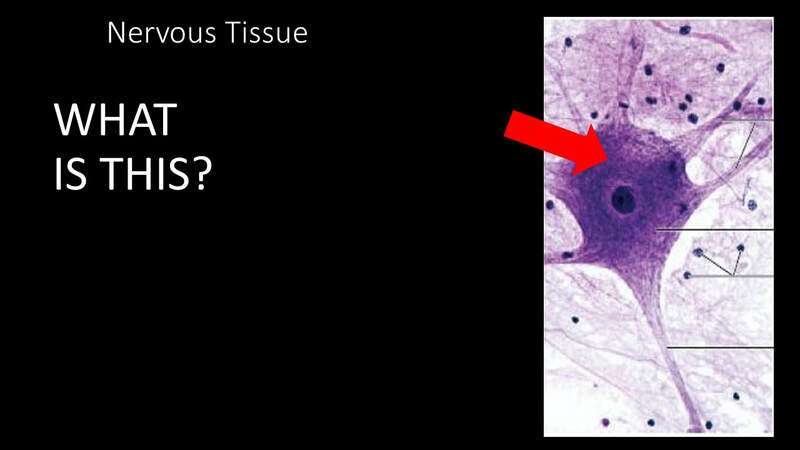 This pathogen causes many of the hospital-acquired infections. E. coli, also use the ED form of glycolysis, but they also have the ability to use EMP pathway. This pathway can operate in the presence or absence of oxygen. This glycolytic pathway can occur in all cells when building materials are needed. The pentose phosphate pathway (PPP) also called the phosphogluconate pathway or the hexose monophosphate shunt. 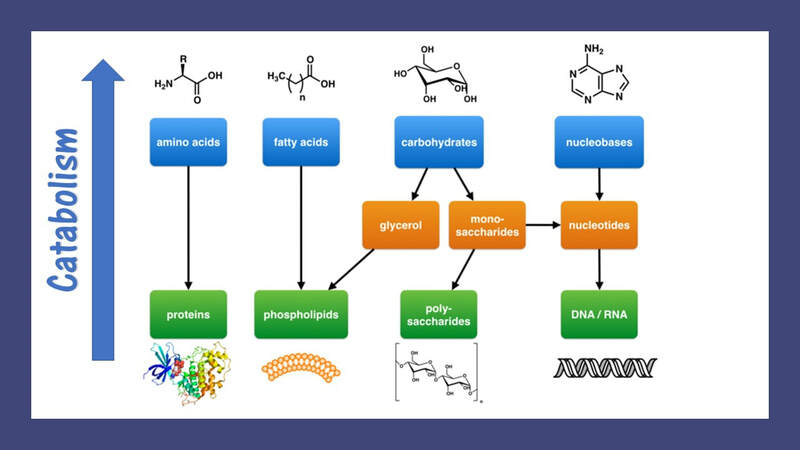 ​ The PPP creates building blocks (or precursors) for amino acids and nucleotides. This form of glycolysis will take place in the cell when amino acids and nucleotides are needed to form proteins and nucleic acids, respectively (RNA or DNA). Before the pyruvate molecules can enter the Kreb's cycle, they must first undergo a transition reaction After glycolysis, each of the three-carbon pyruvate molecules will be decarboxylated to form a two-carbon acetyl group. This produces NADH as well. The acetyl group is attached to a large carrier compound called coenzyme A. The Kreb's cycle is step 2 in cellular respiration. Glycolysis has formed pyruvate which still has more electrons that need to be harvested. 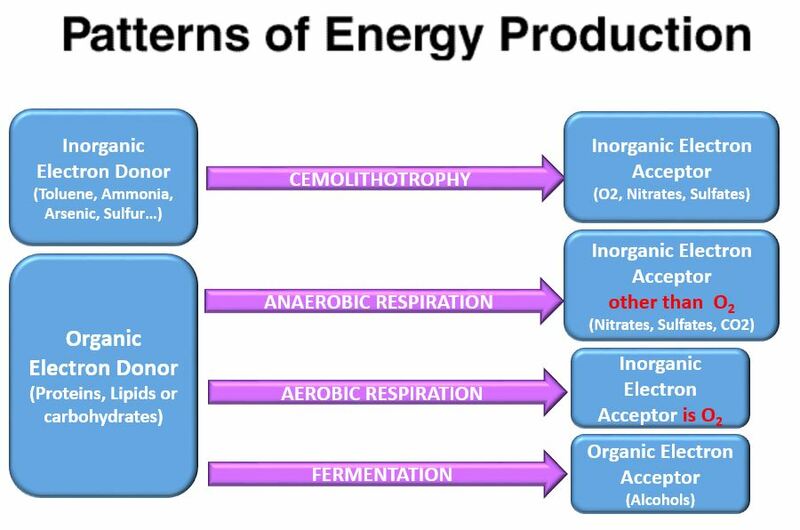 The next process in microbial metabolism is the Kreb's cycle. This process will release additional electrons from the pyruvate molecules. After the transition step, coenzyme A transports the two-carbon acetyl to the Krebs cycle. The acetyl group os then oxidized in the cycle producing three NADH molecules, one FADH2, and one ATP by substrate-level phosphorylation, and releasing two CO2 molecules. The Krebs cycle may be used for other purposes. Many of the intermediates are used to synthesize important cellular molecules, including amino acids, chlorophylls, fatty acids, and nucleotides. In prokaryotes, the TCA or citric acid cycle takes place in the cytoplasm. In summary, the Krebs cycle begins by transferring the acetyl group from acetyl CoA to an oxaloacetate molecule to form the citrate molecule. Citrate then undergoes a series of steps that releases 2 carbon dioxide molecules, 3 NADH, 1 FADH2, and 1 ATP or GTP. The Krebs cycle, is a closed loop. 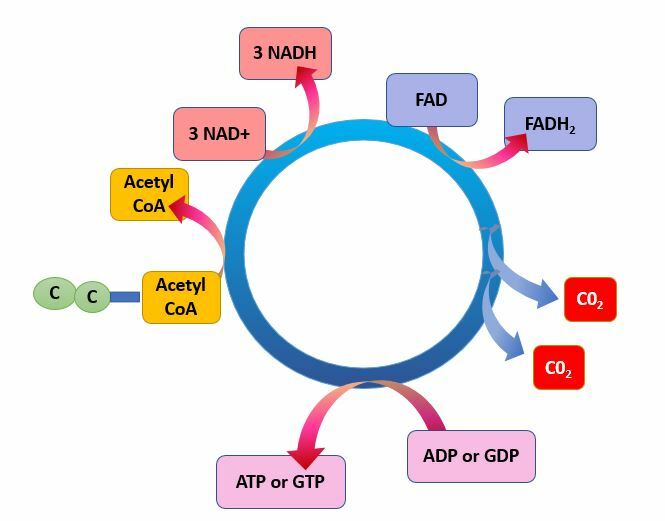 The cycle begins with the two-carbon acetyl molecule and creates 2 CO2, 3 NADH, 1 FADH2, and 1 ATP (or GTP). 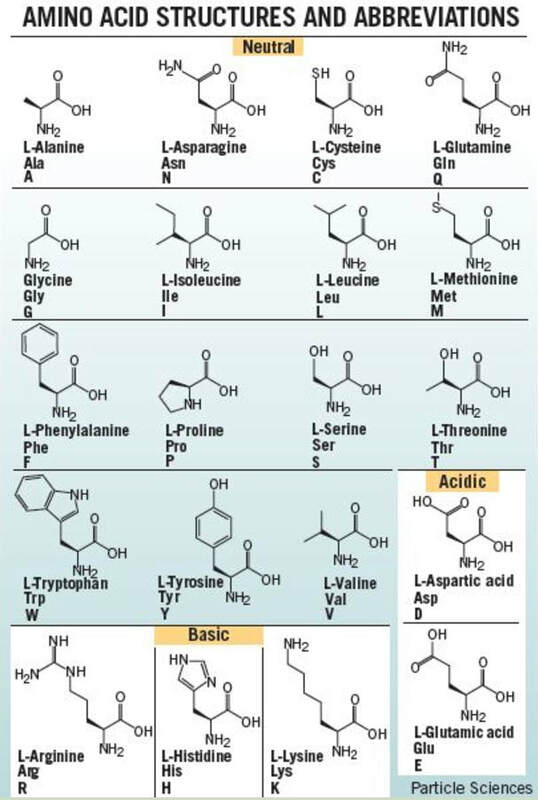 There are also many intermediates produced by the Kreb's Cycle like amino acids, fatty acids, and nucleotides, that the cell uses as building blocks for biosynthesis. Keep in mind that one glucose molecule will take two turns of the Krebs cycle to process. The electron acceptors (NADH and FADH2) generated in glycolysis, the transition reaction and the Kreb's cycle carries electrons to oxygen in the cell. 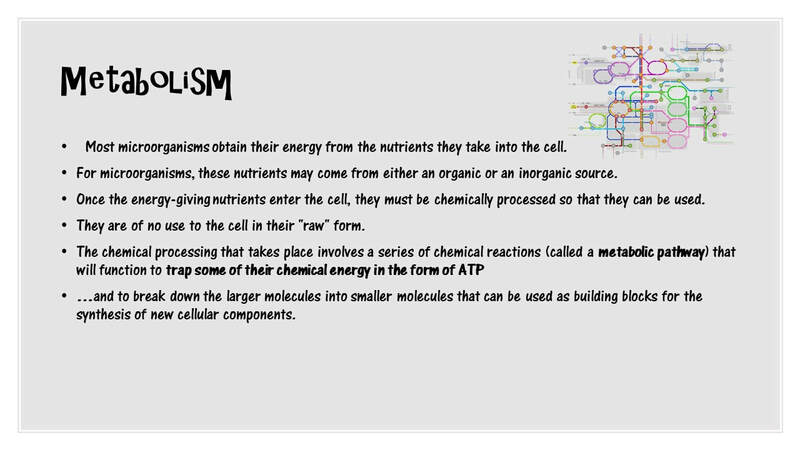 The electrons go to the oxygen via the electron transport chain that lies within the membrane of the cell. In prokaryotic cells, the electron transport chain lies in its cell membrane. The electrons can be delivered to either complex or complex 2 in the electron transport chain. Once at one of these complexes, the electrons gets pulled toward the oxygen molecule as the final electron acceptor. Energy is released as the electrons travel through the electron transport chain and this energy is harnessed to form ATP. The electron transport chain (ETC) exists in the plasma membrane in prokaryotic cells. 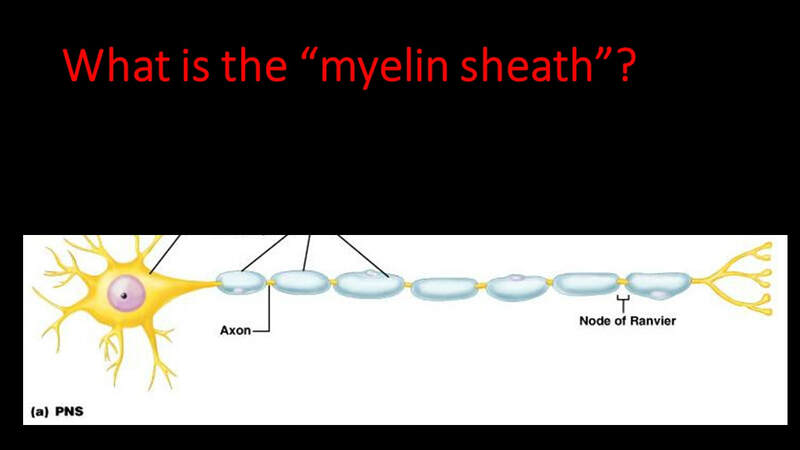 You may recall that this process occurs in the mitochondria in eukaryotic cells. Glucose undergoes glycolysis --> electrons go to NADH --> NADH delivers the electrons to the ETC ---> Energy is released as electrons move through the electron transport chain, and that is used to make ATP. Most of the ATP generated in the electron transport chain, also known as oxidative phosphorylation, which is the final step in cellular respiration. The NADH and FADH2 generated by glycolysis, the transition reaction and the TCA cycle carry electrons to the electron transport chain (ETC). NADH and FADH2 will then release their electrons into the ETC where the electrons move through a series of chemical reactions to a final inorganic electron acceptor (either oxygen in aerobic respiration or non-oxygen inorganic molecules in anaerobic respiration). The ETC is located on the inner part of the cell membrane of prokaryotic cells. The energy of the electrons is harvested to generate an electrochemical gradient across the membrane, which is used to make ATP by oxidative phosphorylation. Prokaryotic organisms have a lot of different mechanisms for getting the energy and nutrients they need from the environment. They can obtain energy from organic substances (like animals do), from sunlight, nitrogen, inorganic carbon, or sulfur! Some microbes can switch between 2 modes of metabolism. As humans, it may be hard to image life without oxygen, but many microbes are perfectly happy to go without! In fact, some prokaryotes will even die if they are exposed to oxygen. Obligate Aerobes - Prokaryotes that require oxygen (O2) for metabolism (aerobic respiration). Humans are an example of obligate aerobes since we absolutely depend upon the presence of oxygen. Facultative Anaerobes - Prokaryotes that exhibit metabolic flexibility. 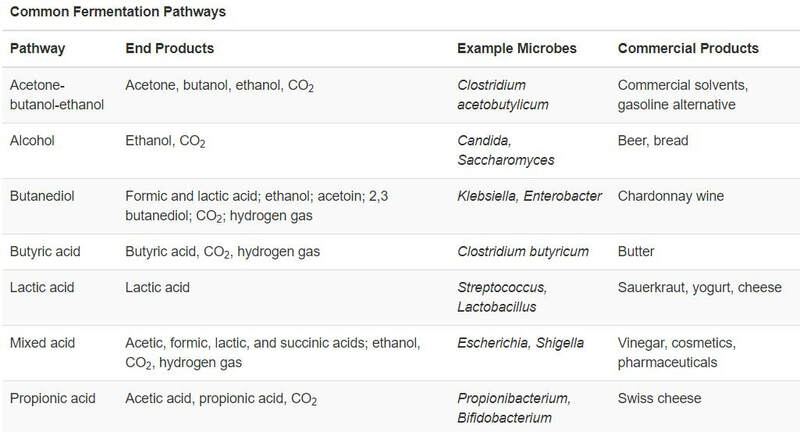 These microbes have metabolic pathways for when oxygen is present and another set of metabolic pathways for when oxygen is unavailable. For example, the bacteria responsible for staph infections and strep throat are facultative anaerobes. Many organisms that do not require oxygen, will undergo a process of fermentation. Fermentation takes place in the absence of oxygen and uses an organic molecule (such as pyruvate) as a final electron acceptor. Fermenting organisms produce only 2 ATP molecules per glucose molecule. Alcoholic fermentation produces ethanol which is used to create alcoholic beverages. The alcohol fermentation reaction begins with the decarboxylation of pyruvate. This reaction releases CO2 and produces acetaldehyde. The enzyme alcohol dehydrogenase then transfers an electron from NADH to acetaldehyde to create NAD+. The microbe commonly used for alcoholic fermentation, baking and even biofeul production is the yeast Saccharomyces cerevisiae. Yeast are single-celled fungi that belong to the Fungi Kingdom in the Eukarya Domain. Bacteria that undergo lactic acid fermentation include Lactobacillus, Leuconostoc, and Streptococcus. Bacteria that are known to use lactic acid fermentation are called lactic acid bacteria (LAB). ,Many LAB are gram-negative and are used in food production. Lactic acid fermentation denatures milk proteins to form yogurt and cheese. Lactobacillus delbrueckii and S. thermophiles are used in yogurt production. There are bacteria that produce more than one fermentation. Such bacteria are said to perform heterolactic fermentation. ,Heterolactic fermentation producing a mixture of lactic acid, ethanol and/or acetic acid, and CO2. The products of heterolactic fermentation are due to the cell undergoing the branched pentose phosphate pathway of glycolysis as opposed to the EMP pathway for glycolysis. Ab example of a heterolactic fermenter is Leuconostoc mesenteroides, which is used for pickling cucumbers to make pickles and for pickling cabbage to produce sour kraut. 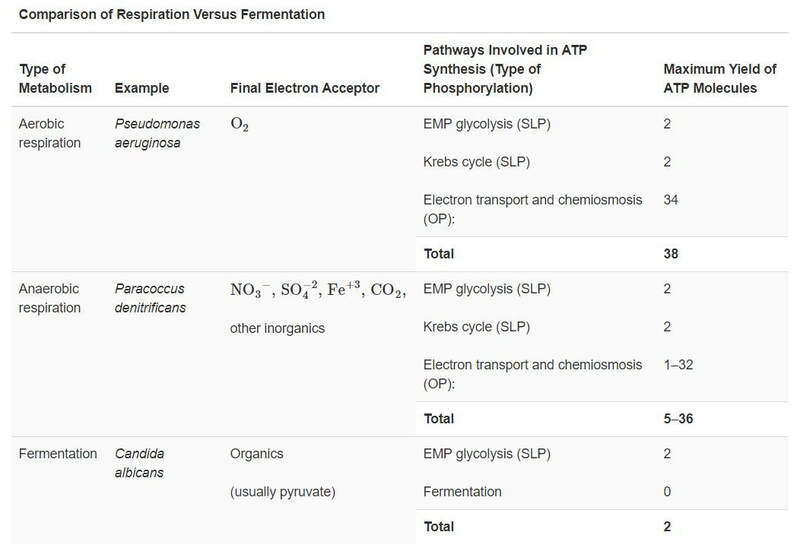 There are several other fermentation pathways in addition to alcoholic fermentation and lactic acid fermentation. These pathways produce useful compounds such as industrial solvents, cosmetics, pharmaceuticals, as well as foodstuffs like butter, beer wine, yogurt, cheese, and vinegar. Most of these pathways also produce CO2 gas, which is used is baking to make breads and cakes rise. Clinically, the API test includes a panel of tests that identify more than 600 species of aerobic and anaerobic bacteria, and about 100 different types of yeasts. The tests produce a metabolic profile for the microbe using pH indicators that can then be matched to a key card to identify the species. 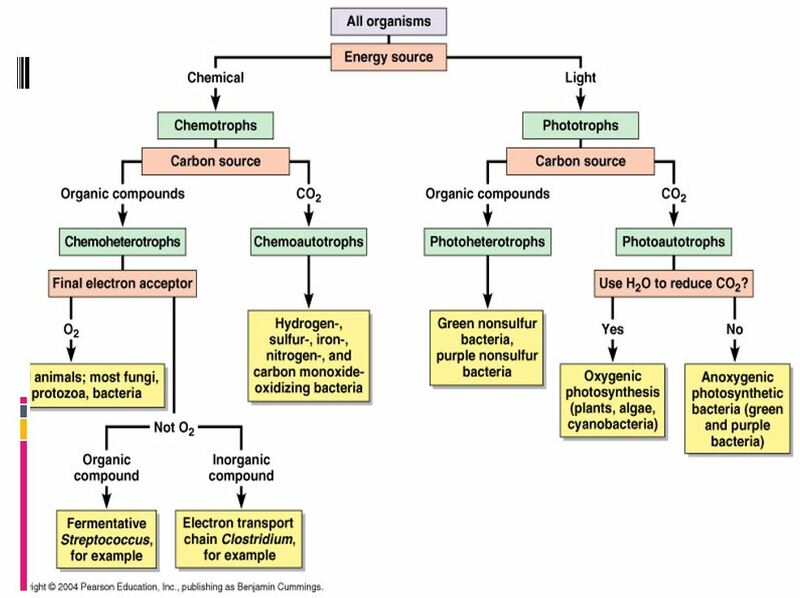 Photosynthetic prokaryotes, such as cyanobacteria, use light energy to remove carbon dioxide from the atmosphere and fix it into organic molecules. This is the same basic process carried out by photosynthetic plants. Have you ever noticed that the chemical equation for aerobic cellular respiration and photosynthesis are basically the same equation in reverse?? THIS EQUATION IS FOR AEROBIC CELLULAR RESPIRATION. Photosynthetic microbes convert solar energy into chemical energy.. Different photosynthetic organisms use different mixtures of photosynthetic pigments, which increase the range of the wavelengths of light an organism can absorb. Photosystems (PSI and PSII) each contain a light-harvesting complex, composed of multiple proteins and associated pigments that absorb light energy. 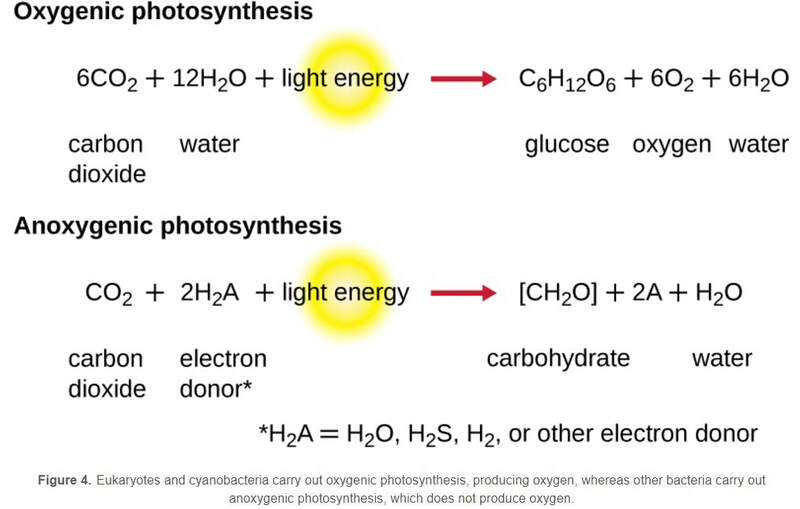 The light-dependent reactions of photosynthesis convert solar energy into chemical energy, producing ATP and NADPH or NADH to temporarily store this energy. In oxygenic photosynthesis, H2O serves as the electron donor to replace the reaction center electron, and oxygen is formed as a byproduct. In anoxygenic photosynthesis, other reduced molecules like H2S or thiosulfate may be used as the electron donor; as such, oxygen is not formed as a byproduct. Noncyclic photophosphorylation is used in oxygenic photosynthesis when there is a need for both ATP and NADPH production. If a cell’s needs for ATP outweigh its needs for NADPH, then it may carry out cyclic photophosphorylationinstead, producing only ATP. The light-independent reactions of photosynthesis use the ATP and NADPH from the light-dependent reactions to fix CO2into organic sugar molecules. Phototrophs - get energy from the sun. Chemotrophs - get energy from chemical compounds. Autotrophs - make their own food from inorganic substances. Photoautotroph - Uses light as its source of energy and uses carbon dioxide (or similar compound) as its source of carbon.